Atlanta Real Estate Forum > Residential > Atlanta Townhomes > Mark Your Calendar: October 13-14 at the Marietta Square! Two-in-one festival means there’s something for everybody to enjoy! If art, entertainment, great food, craft beer and activities for the whole family sound like fun, make plans to attend Chalktoberfest 2018. Traton Homes is a proud sponsor of this popular event, which is actually a fusion of two popular festivals—the Marietta/Cobb Museum of Art’s annual Chalk Fest, and Marietta’s Craft Beer and Wine Festival. It all gets under way on Saturday, October 13 from 10 a.m. to 5 p.m. and Sunday, October 14 from 11 a.m. to 5 p.m. (Chalk Fest runs from noon to 5 p.m. on Saturday only). At the free Chalk Fest, chalk artists from around the world will use their unique talent to turn sidewalks into artwork. Check out the food, live bands, kids’ crafts and Community Chalk Contest. On Sunday, October 14, the popular Marietta Craft Beer and Wine Festival offers unlimited sampling of more than 120 beers and wines for a day-of ticket price of $45. Proceeds benefit the Marietta/Cobb Museum of Art. Year-round festivals and events are just one reason why the Marietta Square has become one of the metro’s hottest areas to live, work and play. If you’ve been thinking about a change, the downtown Marietta lifestyle can’t be beat. North Square from Traton Homes offers spacious, open townhomes priced from the low $300s. The community is walkable to WellStar Kennestone Hospital and the Marietta Square’s many restaurants and shops. You’re just minutes from I-75 and a straight shot to downtown Atlanta or points north. With a pool, cabana and outdoor fire pit, there’s always something fun going on in this top selling Marietta community. Traton Homes also offers The Registry at Marietta Square, an intimate collection of deluxe townhomes with high-end finishes and optional elevators starting in the very low $500s. All the fun and convenience of the Marietta Square is a short walk away! 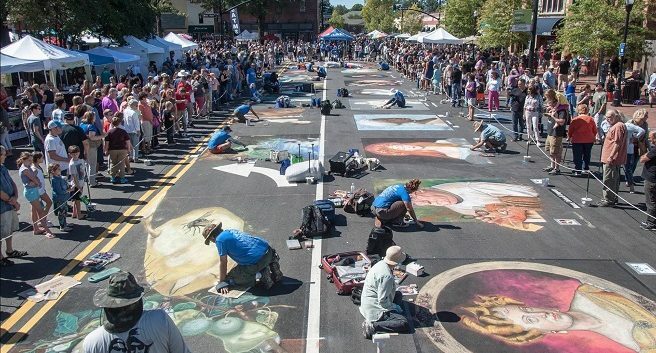 Whether you’re looking for a spacious, beautiful Traton Homes townhome, or you just love a good festival, get to the Marietta Square October 13 and 14 for Chalktoberfest. While you’re out, stop by North Square or The Registry at Marietta Square and learn more about our Altogether More homes and communities!